Making our own greeting cards for friends and family members is a fun holiday tradition in my household, and when the card making stuff comes out, everyone joins in! Now we use some other things like stamps, stencils, cut-outs, paper punches, holiday paper, decorative scissors, old Christmas cards and anything else we have on hand! We make many of our own stamps by putting foam stickers on bottle caps and make stencils and patterns from recycled cereal and cracker boxes. After writing down a list of people we need to make cards for, we get busy. Trees, presents, sleighs, candy canes, snowmen, holly, stockings, snowflakes, bows, a nativity scene, a snow scene, a cabin in the woods, a religious symbol, train, puppy, a cup of hot cocoa, penguin, gingerbread house, etc. When it comes to making homemade greeting cards, anything goes! For us, the main idea is to think of how to put a smile on someone’s face this holiday season and to be as creative as we can be. The natural benefits of making homemade greeting cards? We make our own holiday cards because it is something we enjoy and look forward to doing a few times a year, but there are many natural benefits to making them, depending on the challenge we are up to at the time. Making cards that pop-up or out, slide, or fold a certain way, all take patience, planning and measuring. Simple cards can offer the maker a chance to be creative, use their imagination, practice cutting and/or drawing skills, and help to build language skills and self-confidence. We personally find it fun to challenge and add to what we already know. I hope holiday card making becomes a fun family tradition in your home, as it has in mine. This site offers illustrated instructions for making a beautiful holiday pop-up card with presents inside. Illustrated pictures show you how to make a simple pop-up card. Be sure to check out the how-to video on the bottom of the post as well. Better Homes and Gardens offers a slide show of 35 Christmas cards made with a variety of items such as felt, paper, fabric scraps, recycled materials and a few other things. This slide show, on the same site, has 13 more cards. If you have some old Christmas cards that you would like get creative with, you will find some wonderful ideas here on this same site. 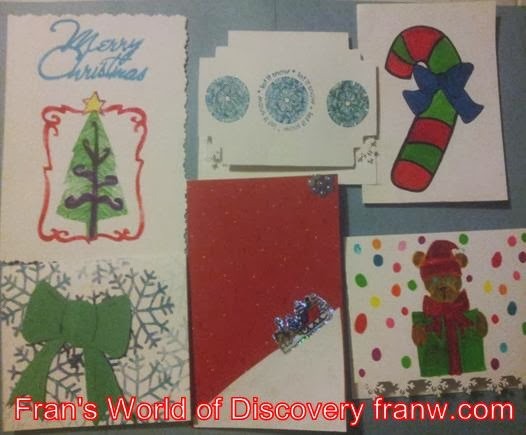 HGTV: 16 Handmade Holiday Cards – Move through the picture gallery via the arrows on the left and right of the picture. Handimania: 17 Beautiful DIY & Homemade Christmas Card Ideas – Scroll down to check them all out! Good to hear that you love to make cards. I am also passionate about card making and always make card for for occasions. For this Christmas I am planning to make folded Christmas greeting cards for my friends and relatives. Thank you for the comment, Alison! I'm so happy to hear that you are so passionate about card making! I think it is really important to keep this craft alive!